Borrowed from New Latin latex (“clear fluid which is part of a humour or bodily fluid”), a later use of Latin latex (“water; liquid, fluid”). Potentially a borrowing from Ancient Greek λᾰ́τᾰξ (látax, “drop of wine”), reformed by analogy to other nouns in -ex. The semantic shift, however, from drop of wine to water is difficult to explain and may indicate that both words originated from a separate language. Perhaps from the same root as Proto-Celtic *lati- (Old Irish laith (“liquid, beer”), Welsh llad (“beer”)) or Proto-Germanic *ladjō- (Old High German letto (“clay, loam”), Old Norse leðja (“mud, dregs”)) or from a Pre-Greek language. 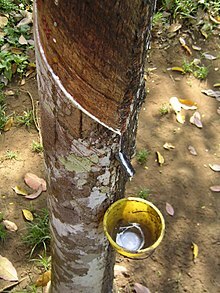 (uncountable) Natural latex rubber, especially non-vulcanized rubber, such as is used in making latex gloves, latex condoms, and latex clothing. ⁠ , Oxford: Oxford University Press, June 2015. Borrowed from New Latin latex (“clear fluid which is part of a humour or bodily fluid”), a later use of Latin latex (“water; liquid, fluid”). “latex” in le Trésor de la langue française informatisé (The Digitized Treasury of the French Language). Potentially a borrowing from Ancient Greek λᾰ́τᾰξ (látax, “drop of wine”), reformed by analogy to other nouns in -ex. The semantic shift, however, from drop of wine to water is difficult to explain and may indicate that both words originated from a separate language. Perhaps from the same root as Proto-Celtic *lati- (Old Irish laith (“liquid, beer”), Welsh llad (“beer”)) or Proto-Germanic *ladjō- (Old High German letto (“clay, loam”), Old Norse leðja (“mud, dregs”)) or from a Pre-Greek language. (New Latin, botany) Milky liquid which exudes from a plant when cut and which coagulates on exposure to air.